Photographer, Beth Pelton grew up in Massachusetts and now resides in a farmhouse with her family in rural New Hampshire. An obsession with the art of photography and the adventure from lens to print started in a high school dark room. "I could spend hours processing black and white photographs. I loved it! My instructors were a great inspiration and believed in my work." Beth has a background in graphic design and holds a bachelor's degree in Environmental Education from the University of Wyoming. 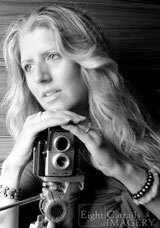 Her photographic work has been in several New England travel publications and appears regularly in At Home Magazine, The Monadnock Table magazine, and The Business Journal. Beth also freelances for the Brattleboro Reformer, Keene Sentinel, WGBY Public Television and most recently The Other Cape, which celebrates life on Cape Ann, Massachusetts. Her work has been exhibited around New England and has been selected in juried shows, winning an award of excellence in 2015, as well as placing in regional photography contests such as the Connecticut River Conservancy Photo Contest of 2016. Beth also serves on the Board of Directors at the Vermont Center for Photography. "Beth Pelton of Eight Cattails Imagery is not only an outstanding photographer, she's a professional. We enjoy working with her because she works hard to understand the concepts we outline, asks the right questions, and delivers amazing results. If you need a photographer who is going to give you what you need, meet every deadline, and truly care about your project, I highly recommend Beth Pelton of Eight Cattails Imagery." "Your photos capture the excitement and beauty of our animals. They are showstoppers; grabbing a viewer's eyes and heart. Thank you, Beth, for sharing your talents with us. Your work has helped many of Monadnock Humane Society's cats and dogs find their way home!" "WGBY, a public TV and PBS member station out of Springfield, MA, relied on Beth Pelton and Eight Cattails Imagery to capture our 2016 Masterpiece Ball. Our event was a large production with hundreds of glamorous guests. So, we needed the night documented by a photographer with an eye for magical moments. Beth Pelton delivered, giving us high-quality photos that conveyed the joy and beauty of the night. I would confidently work with her again." “Beth recently photographed our event, Dinner on the Ashuelot Covered Bridge. She truly captured the joyful essence of the occasion, AND the photos that she took of the event are going to be featured on Boston Chronicle in the near future. Not only does Beth have a special gift with photography, but she is also a lovely person to work with.